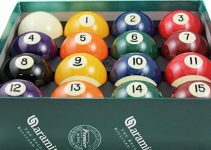 Stuck on how to shape a pool cue tip with sandpaper? Luckily you actually don’t need those specially designed pool cue tip shaping kits to do this task. Simple sandpaper is quite handy and can actually give you the freedom to give the custom shape to the tip that suits your style of stroke play. But I will assume that you are new to the game so let’s keep it really simple. Firstly, if you have not glued the tip yet onto the cue then make sure that you grind one end of the cue so that it is flat and can easily get glued on to the ferrule. Once the gluing is done now comes the part where you will need the sandpaper to shape the tip. It’s time to use the sandpaper again but this time it’s better that you make sure that you cover up the ferrule with masking tape before using the sandpaper on the tip. Because any damage done on the ferrule is irreversible and it’s not worth damaging the business end of the cue and it’s a pain to chain the ferrule. 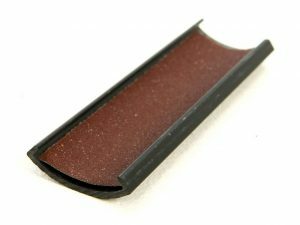 So after making sure that the ferrule is properly secured, take the sandpaper and place it inside some curvy cardboard something like the picture attached. Place the cue tip inside and then rotate the cue tip. It would remove the extra part hanging beyond the ferrule. If you are not able to make this then take a sharp knife and peel off the tip part that has gone beyond the diameter of the ferrule. Once you are done with that now take medium roughness sandpaper and from the center of the tip grind the tip in a downward direction towards the edge. While you are doing this, make sure that you are continuously turning the cue as well. This movement will make sure that you have even tip. As a caution, do not scuff the tip from the edge toward the center of the tip. Tips have layered structure and this would damage it and making the tip slippery while playing the stroke. So its very important that you grind it from the top towards the bottom. 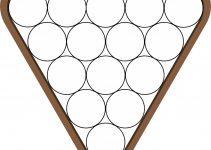 Now you will observe that the center is at a higher height than the edges of the tip. To make it even take the coarser sandpaper and giving just a few rubs on the tip top. This will even down the tip and also create holes on to the surface. These tiny holes are quite important as this is the place where the chalk gets struck which gives the grip while playing the shot. Alternatively, you can also poke small holes on to the tip with a needle just make sure that you don’t apply a lot of force. So, it is quite easy, the first time you may not get it right. It would be a better idea if you buy a spare tip in case things don’t go as planned. Also importantly, If you miss the last step than the tip will be shaped right but it will slip while playing the shots. It’s important that you make the holes that allow the granules of the chalk to get stuck in.